Heading north from Izmir towards Çanakkale, we came to the Adatepe Olive Oil Museum, in Küçükkuyu. Again, we were the sole visitors at a very interesting site. The museum is a restored soap factory designed to display artifacts related to olive culture. It’s the only one in Turkey devoted to the history of olive oil production. The museum extracts oil by traditional cold-press methods in its factory and stores the oil for families in the area. We saw huge granite mills for grinding olives, various tools for pruning and olive picking, baskets for carrying olives, and earthenware jars for olive oil storage. 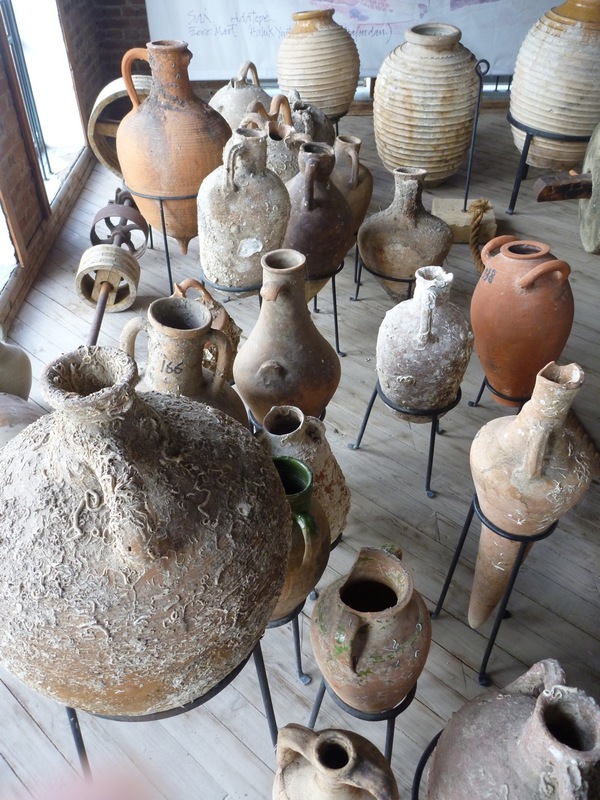 There are also amphoras from sunken ships of early Mediterranean trade (which never made it to the Bodrum symposium). There are displays of various tools for making olive oil soap, charts of the annual cycle of olive production, maps showing the spread of olives from Syria westward, and writings in Jewish, Christian, and Islamic sacred texts. 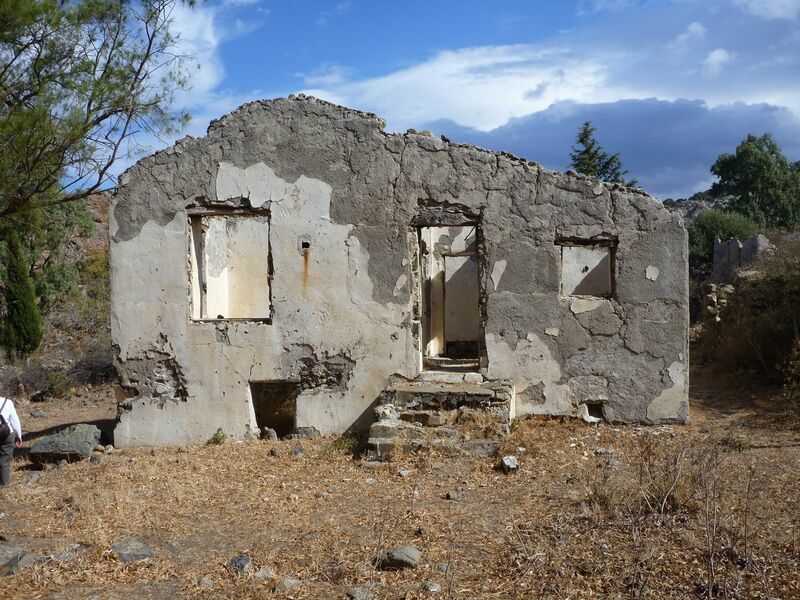 We went to the (almost) abandoned village of Sandima yesterday. 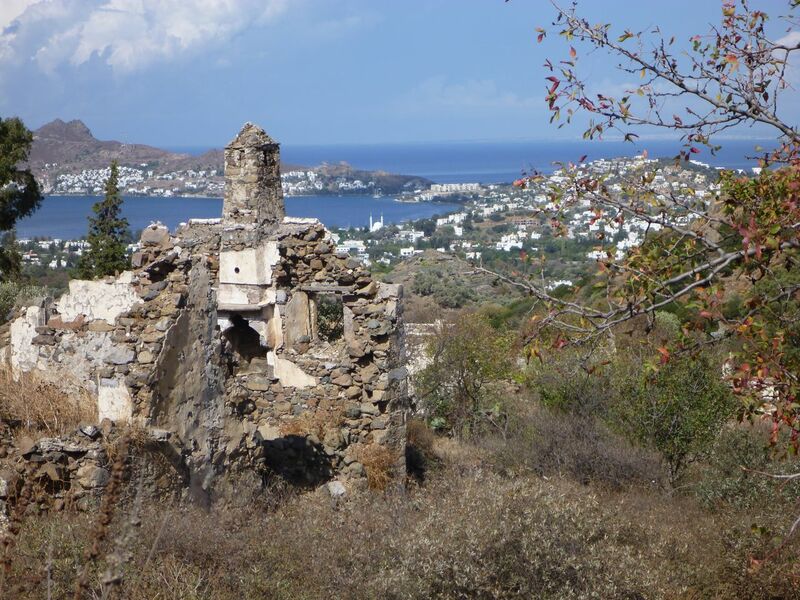 The story is that it was wiped out three times: once many centuries ago by the bubonic plague, when many residents died and the village had to move; again by the citrus industry, which lured away the young people to work in the orange groves closer to Yalikavak; and a third time, by rampant development, which has covered hillsides with white block houses for people seeking the Mediterranean sun and lifestyle. The village is just up the hill from Yalikavak. It looks like an old war zone, with abandoned homes, stone walls, watering stations, and a mosque, all now becoming overgrown with vines and scrub vegetation. There are two schools, an older, religious school, next to the mosque, and a newer one with four rooms. 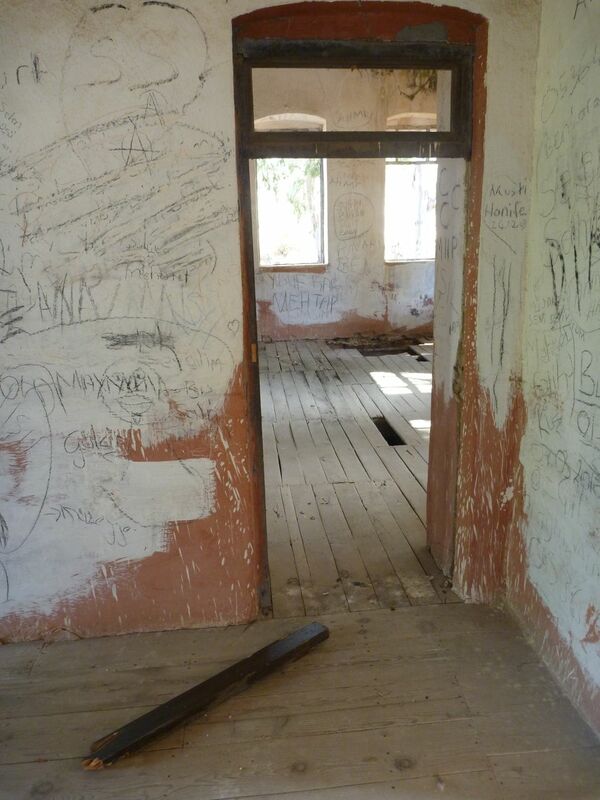 The latter looks as if it must have been an attractive site for learning at one time, but now is missing doors, has large holes in the floor, and is covered with graffiti. It’s possible to follow old footpaths and to go into the buildings, which are not much more than piles of rubble, everything of value having been removed. There’s a second abandoned village just across a ravine. There are only three residents in Sandima today. One is an 86-year-old man who refused to leave. His story is that he walks into Yalikavak every day, not for work or food, he has his garden and cows in Sandima, but to look for a mate. 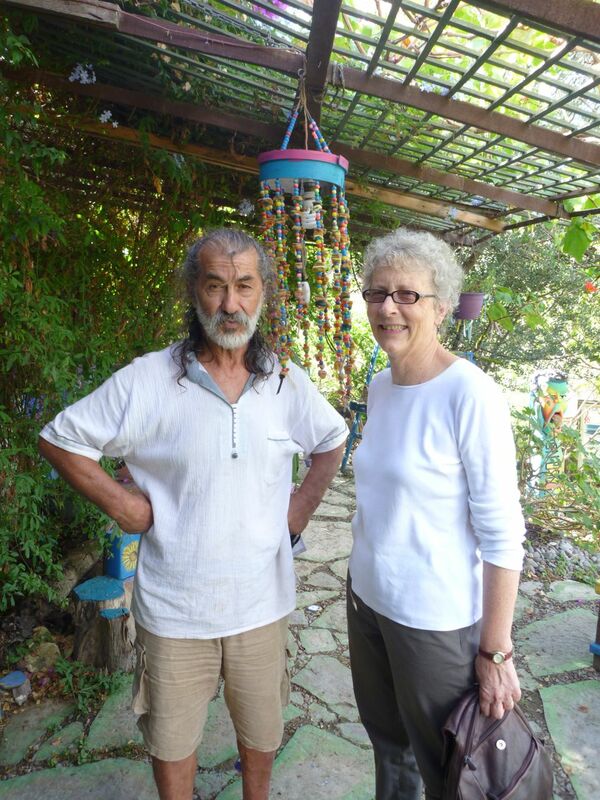 There are also two artists, Ismail Erkoca and Nurten Değirmenci. Ismail gave us a tour of their house, which is the most decorated one I’ve ever seen. Every surface, including floor and ceiling, was covered with art works, or just painted, or festooned with bougainvillea, lantana, hibiscus, and other flowers. Navigating the nooks and crannies, bridges, and hidden passageways required a guide. It soon became clear that if selling artwork were not a business, then giving tours of the house could become one. 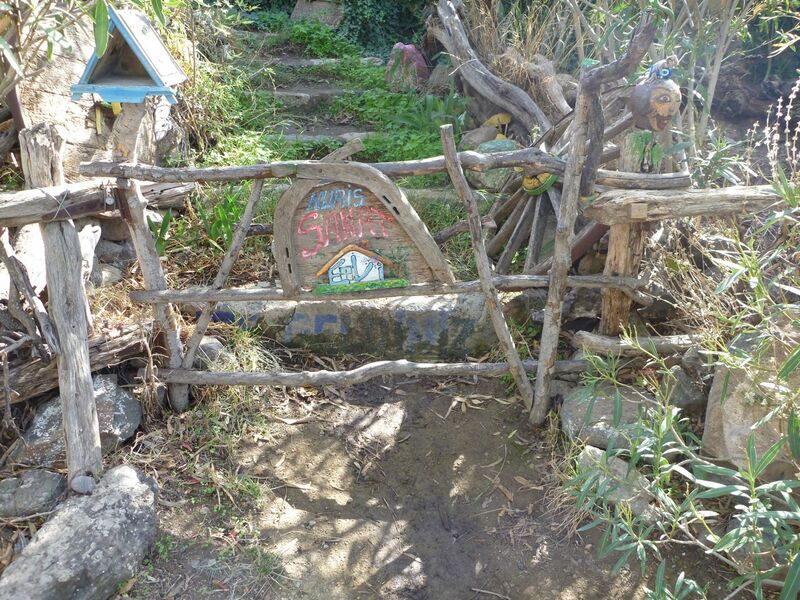 The house is called Nuris Sanat Evi, Nur from Nurten and Is from Ismail. Sanat Evi means art house. The story of the name (we heard many stories) is that Nur means holy light and Is means black soot from a fire. So, one needs light to see the darkness. We enjoyed the adventure of talking with Ismail and getting a glimpse of his life, one far removed from İstanbul, where he was born. I was pleased to learn more about the Köy Enstitüleri (Village Institutes) from Ismail. I wonder whether the newer school in Sandima was created following John Dewey’s report or somewhat later as a result of the institutes? I’ll save thoughts on that for a future post. Who’s responsible for the fragility of Haiti? Lindskoog shows how USAID policies led to structural changes in the countryside, which predictably forced Haitian peasants who could no longer survive to migrate to the cities, especially Port-au-Prince. Promised manufacturing jobs failed to materialize. Port-au-Prince became overpopulated and slum areas expanded. Poorly constructed housing followed and the eventual abandonment of the US-led development model. Haitians, with virtually no financial resources were left to address the problems they had not created. There’s more than corn and beans in the farmland here. Last Sunday, we visited an apple farm/orchard in Monticello, Illinois, which had 17 varieties. Appropriately (for Monticello), one was Thomas Jefferson’s favorite, Spitzenberg. We got a little carried away and bought five half-pecks for $20. Fortunately, one is a long-keeper, Buff, which is supposed to last until late winter if it stays cold. If we don’t eat them all, we can feed them to our deer. See this backyard scene, where we played boule at the potluck in honor of John Dewey’s 150th birthday on Tuesday.